Definition at line 48 of file llfloateravatarpicker.h. Definition at line 53 of file llfloateravatarpicker.h. Definition at line 85 of file llfloateravatarpicker.cpp. References LLUICtrlFactory::buildFloater(), gUICtrlFactory, and NULL. Definition at line 134 of file llfloateravatarpicker.cpp. References gFocusMgr, NULL, LLFocusMgr::releaseFocusIfNeeded(), and sInstance. Definition at line 214 of file llfloateravatarpicker.cpp. References LLPanel::childSetEnabled(), LLScrollListCtrl::deselectAllItems(), FALSE, LLScrollListCtrl::getAllSelected(), LLInventoryModel::getItem(), gInventory, LLInventoryType::IT_CALLINGCARD, mAvatarIDs, mAvatarNames, mListNames, and TRUE. Definition at line 373 of file llfloateravatarpicker.cpp. References FALSE, LLLineEditor::getText(), and TRUE. Definition at line 258 of file llfloateravatarpicker.cpp. References LLScrollListCtrl::addSimpleElement(), LLMessageSystem::addString(), LLMessageSystem::addUUID(), agent_get_id(), agent_get_session_id(), agent_send_reliable_message(), LLSD::asString(), LLPanel::childGetValue(), LLPanel::childSetEnabled(), LLScrollListCtrl::deleteAllItems(), FALSE, LLUUID::generate(), gMessageSystem, mListNames, mQueryID, mResultsReturned, LLMessageSystem::newMessage(), and LLMessageSystem::nextBlock(). Definition at line 387 of file llfloateravatarpicker.cpp. References LLPanel::childHasFocus(), LLFloater::close(), LLPanel::handleKeyHere(), KEY_ESCAPE, KEY_RETURN, MASK_NONE, onBtnAdd(), onBtnFind(), and TRUE. Definition at line 147 of file llfloateravatarpicker.cpp. References FALSE, LLUUID::null, and TRUE. Referenced by handleKeyHere(), and postBuild(). 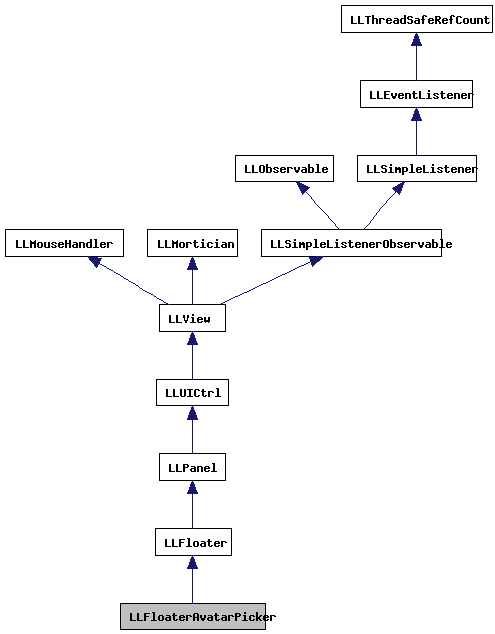 Definition at line 170 of file llfloateravatarpicker.cpp. Definition at line 141 of file llfloateravatarpicker.cpp. Definition at line 176 of file llfloateravatarpicker.cpp. Definition at line 204 of file llfloateravatarpicker.cpp. Definition at line 94 of file llfloateravatarpicker.cpp. References LLScrollListCtrl::addSimpleElement(), LLAssetType::AT_CALLINGCARD, LLPanel::childDisable(), LLPanel::childSetAction(), LLPanel::childSetCommitCallback(), LLPanel::childSetDoubleClickCallback(), LLPanel::childSetFocus(), LLPanel::childSetKeystrokeCallback(), editKeystroke(), FALSE, LLPanel::getCtrlByNameAndType(), LLUICtrlFactory::getScrollListByName(), LLInventoryType::IT_CALLINGCARD, mInventoryPanel, mListNames, onBtnAdd(), onBtnClose(), onBtnFind(), onList(), onSelectionChange(), LLInventoryPanel::openDefaultFolderForType(), setAllowMultiple(), LLInventoryPanel::setFilterTypes(), LLView::setFollowsAll(), LLInventoryPanel::setSelectCallback(), LLInventoryPanel::setShowFolderState(), LLInventoryFilter::SHOW_NON_EMPTY_FOLDERS, TRUE, and WIDGET_TYPE_INVENTORY_PANEL. Definition at line 300 of file llfloateravatarpicker.cpp. References _PREHASH_AvatarID, _PREHASH_Data, _PREHASH_FirstName, _PREHASH_LastName, agent_get_id(), DB_FIRST_NAME_BUF_SIZE, DB_LAST_NAME_BUF_SIZE, LLScrollListCtrl::deleteAllItems(), FALSE, LLMessageSystem::getNumberOfBlocks(), LLMessageSystem::getStringFast(), LLMessageSystem::getUUID(), LLMessageSystem::getUUIDFast(), i, LLUUID::isNull(), mListNames, S32, sInstance, and TRUE. Definition at line 286 of file llfloateravatarpicker.cpp. References mAllowMultiple, mInventoryPanel, mListNames, LLScrollListCtrl::setAllowMultipleSelection(), and LLInventoryPanel::setAllowMultiSelect(). Referenced by postBuild(), and show(). Definition at line 56 of file llfloateravatarpicker.cpp. References LLFloater::center(), FALSE, LLFloaterAvatarPicker(), mCallback, mCallbackUserdata, mCloseOnSelect, LLFloater::open(), setAllowMultiple(), and sInstance. Referenced by LLPanelEstateInfo::accessAddCore2(), LLPanelGroupInvite::impl::callbackClickAdd(), LLFloaterSellLandUI::doSelectAgent(), LLPanelLandBan::onClickAdd(), LLPanelLandAccess::onClickAdd(), LLPanelFriends::onClickAddFriend(), LLPanelDatabase::onClickChangeAvatar(), LLPanelRegionDebugInfo::onClickChooseAvatar(), LLPanelRegionGeneralInfo::onClickKick(), LLPanelEstateInfo::onClickKickUser(), LLFloaterMute::onClickPick(), LLFloaterReporter::onClickSelectAbuser(), and LLPanelObjectTools::onClickSet(). Definition at line 85 of file llfloateravatarpicker.h. Definition at line 83 of file llfloateravatarpicker.h. Definition at line 84 of file llfloateravatarpicker.h. Definition at line 91 of file llfloateravatarpicker.h. Definition at line 88 of file llfloateravatarpicker.h. Definition at line 81 of file llfloateravatarpicker.h. Referenced by postBuild(), and setAllowMultiple(). Definition at line 80 of file llfloateravatarpicker.h. Referenced by doSelectionChange(), find(), postBuild(), processAvatarPickerReply(), and setAllowMultiple(). Definition at line 86 of file llfloateravatarpicker.h. Definition at line 87 of file llfloateravatarpicker.h. Definition at line 94 of file llfloateravatarpicker.h. Referenced by processAvatarPickerReply(), show(), and ~LLFloaterAvatarPicker().